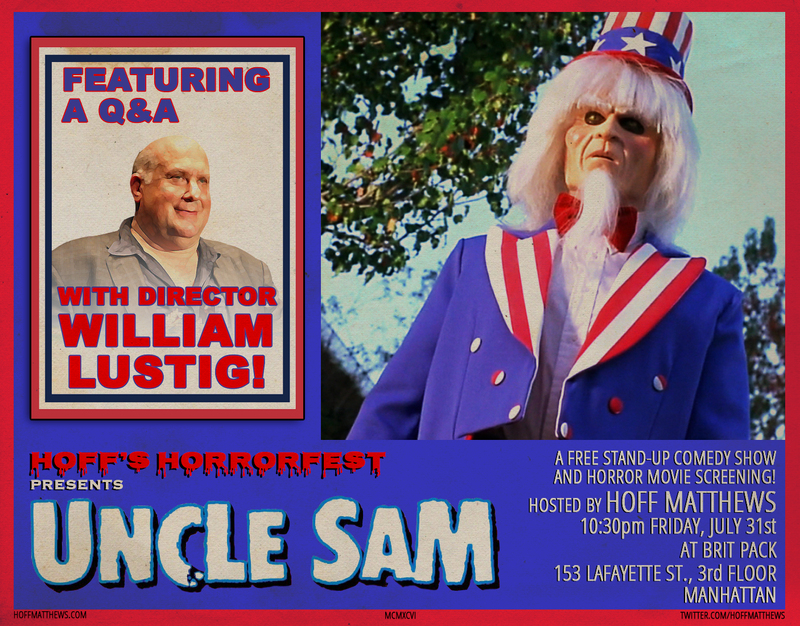 Hoff’s Horrorfest Presents: UNCLE SAM + Q&A w/Director WILLIAM LUSTIG! UPDATE: A previous version of this page listed this event as taking place at Brit Pack’s new location on Pell St., but the show will actually be happening on the 3rd floor of 153 Lafayette St. in Manhattan. Hoff’s Horrorfest is a monthly show at Brit Pack (3rd floor, 153 Lafayette St., Manhattan) featuring stand-up comedy followed by a horror movie screening and, in this case, a director Q&A! It’s free and BYOB. This month’s installment will be at 10:30pm, Friday, July 31st. The dog days of summer are upon us, and after the vacation-by-the-lake hijinks of Friday the 13th Part 3 I’m now moving on to some seasonal Independence Day patriotism with Uncle Sam, a supernatural slasher flick about a deceased Gulf War vet who returns from the grave to terrorize some insufficiently America-loving townsfolk! It’s an energetic shocker laced with ahead-of-its-time social satire and boasts a great cast that includes Isaac Hayes, Robert Forster, Timothy Bottoms and P.J. Soles. And as if that weren’t enough, William Lustig–director of Uncle Sam as well as of the Maniac Cop films, Maniac, Vigilante, and many others–will be joining us after the movie for a Q&A! He was super fun when I had him on for my Maniac Cop 2 screening and I’m thrilled to have him back. Friday, July 31st! See you there!